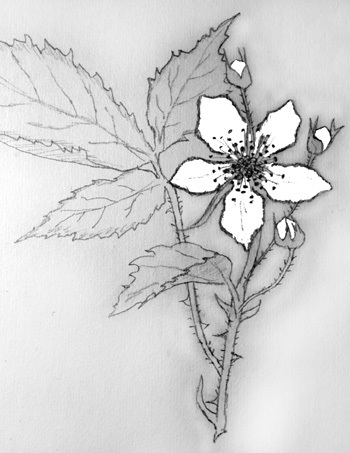 Common blackberry is a shrub-like wildflower, measuring 1.2-1.8 m. in height. It is most easily identified by its juicy, black, clustered berries and pinnately-compound leaves. The radially symmetrical, white flowers are arranged singularly atop the terminal shoots of very prickly, robust stems. 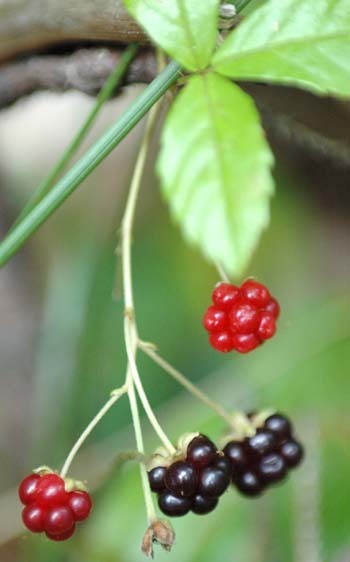 Rubus allegheniensis leaves and fruit. The flowers of common blackberry measure approximately 2 cm. in width. Each radially symmetrical bloom has a prominent center comprised of numerous stamens and pistils, surrounded by five broad, tapered, white petals and supported by five green sepals. The compound leaves are long, measuring approximately 7.5-15 cm. in length, and have three to seven lanceolate, dark green leaflets with toothed margins and prickly petioles. 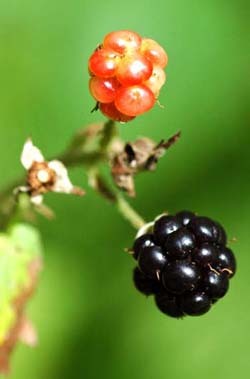 Common blackberry grows best in dry prairie, woodland meadows, and along streams and roadsides. Common blackberry is an edible plant that is commercially grown for consumption.